With so many different companies out there all getting into the log splitting industry it can get difficult to know what sets them all apart. So what sets NorthStar apart from the competition, what makes them the best brand to buy?. 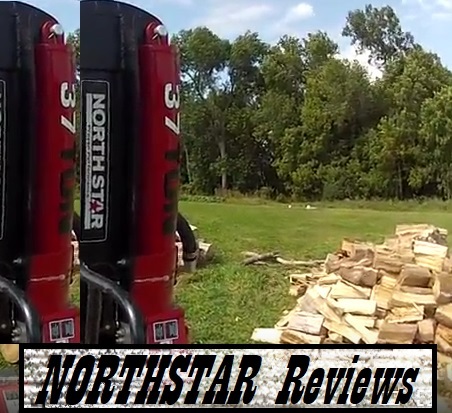 This is what I aim to reveal to you as I present these NorthStar log splitter reviews. 2.1 Does The NorthStar Offer Vertical Log Splitting? One of the main things that sets them apart from other companies is that they manufacture there tools right here in the USA. Which is an important thing for a lot of people. I do wish I could say all there parts were made in America, but I could only find out there pumps and valves are made in the USA. So while maybe not all there parts are made in America the 2 key components that are considered the heart of a log splitter are. Northern Tools are responsible for manufacturing NorthStar log splitters who are a great American company. While they have been in the business for 35 years, they manufacture there log splitters in Faribault Minnesota. It is a family run business and is operated by a dad and his two sons, which I believe to be a very important factor. What this means is that every time they make a product, it is their families name and livelihood on the line. And with most people, when something so important is on the line, that is when they start to shine. You can see this in the high quality log splitters they produce. Below you will find my NorthStar log splitter reviews on what I consider to be some of the best log splitters on the current and future market. There is a lot to love about this NorthStar 37 ton wood splitter. From it’s extreme amount of power to the finer design details many companies leave out. But the first thing I really like about this log splitter is its Honda GX 270cc engine. This is a really great engine and one that I am a personal fan of. It is just an extremely reliable and very strong engine that provides plenty of power. The main feature I love about this engine is just how reliable it is. After several years of work and a massive amount of cords pushed through. This engine was still starting within the first 3 pulls. Which is exactly what you want when you’re spending this kind of money on a machine. The power is output is simply outstanding on this 37 ton model. In the whole time using this machine, I never came across a log I couldn’t split. I have put huge knotted logs that were well above there recommended sizes and this thing got right through them. I ran some oak, hickory, and elm through this thing. With some of them being up to 40 inches in diameter. Does The NorthStar Offer Vertical Log Splitting? With some of the larger logs I swapped this machine into it’s vertical position so I didn’t have to lift such large logs up onto the splitter. While in it’s vertical position I was able to split logs that were even larger but did them by splitting from the outside in. That is one of the true benefits to owning a vertical log splitter. 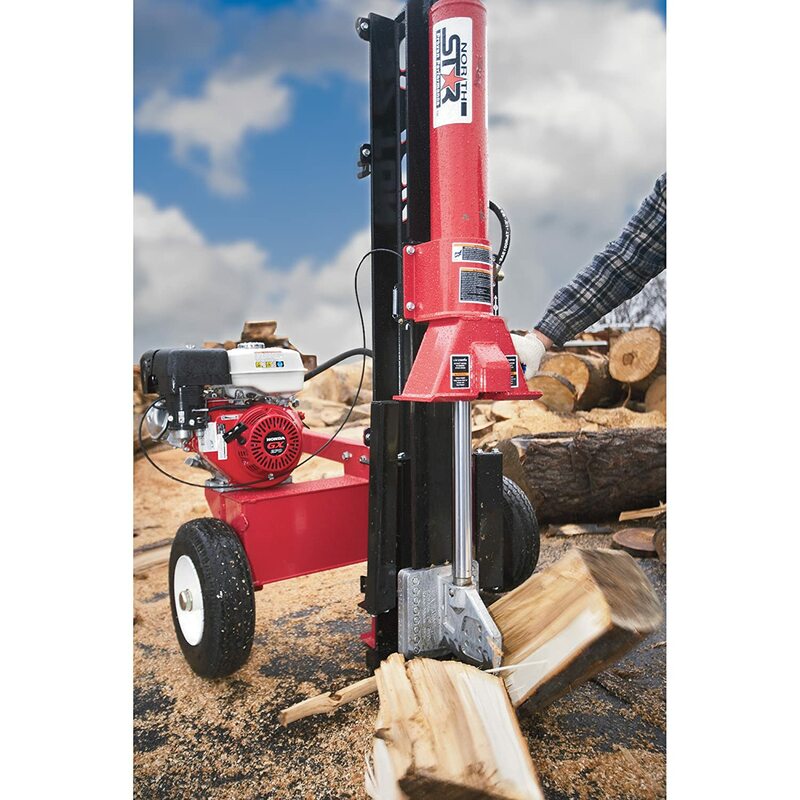 With this log splitter any splitting task you have in front of you will be made into an easier task. It’s a really quick log splitter for such a high amount of force (37 Tons). I’m super impressed by the speed of which you can get through cords of wood. While it’s manufactures say it takes about 14 seconds, I found it to be a little under at just a bit over 13 seconds. This certainly isn’t the quickest machine on the market but it still is very fast. But when you combine the true power and the decent cycle time, you really get to understand how much quicker splitting can be. When running a cord of oak through it, it took roughly an hour to get done. Certainly beats splitting the old fashioned way. The 37 ton by Northstar is available in 3 models that differ in engines and features. Read the Comparison review here to discover which is best for you. See this powerful machine in action. Watch as it works through this wood in the vertical position. Something that is truly amazing to experience. The NorthStar 30 ton log splitter is a real beast that offers some great features not seen on similar machines. The feature I’m talking about and highly encourage is the auto throttle. NorthStar has helped fixed one of the problems a lot of the bigger splitters have, and that is there auto throttle control. This feature makes this log splitter use less fuel which is a pretty important thing, for someone who has to split as much wood as I do. Anyway you can save a penny is highly rated in my household. It also makes the engine quieter when idling which was something that I noticed instantly. As you may be well aware, log splitters can get quite noisy. So being a little quieter than most of this size was a nice addition. But where the auto throttle control really shined was when it was splitting knotty hard logs. When it hit knotty or hard spots you could hear it switch into a lower gear to power on through. Smart technology at its best. 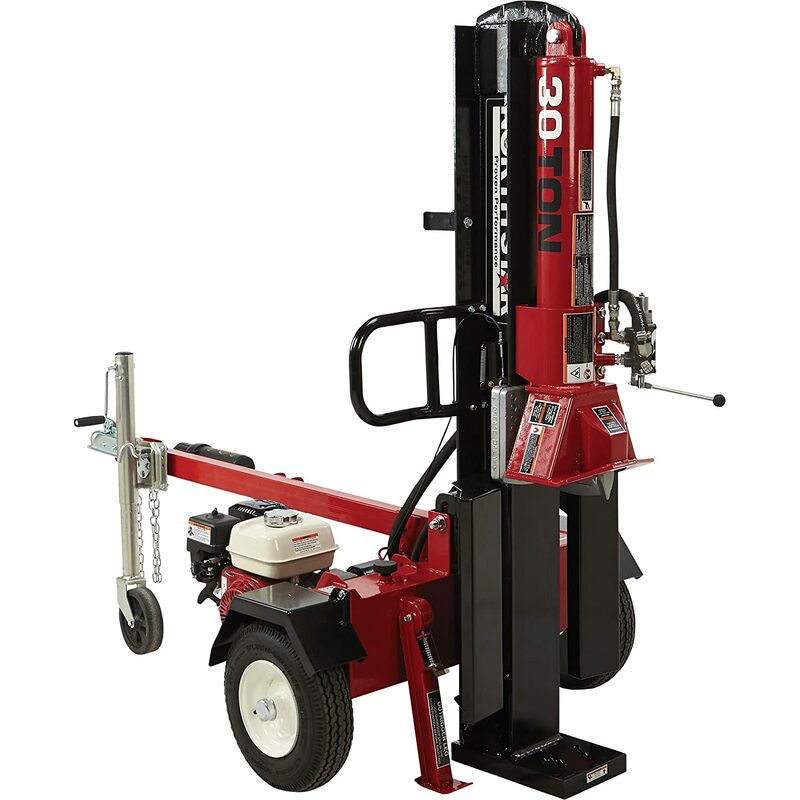 When it comes to the splitting ability of this machine, it is certainly up there with the best of them. It won’t be able to split what the 37 ton above can, but it certainly gets close. I mainly split oak cords with this thing and it got through everything I threw at it. With some of those logs being 34 inches in diameter. I did split the larger 34 inch logs while in it’s vertical position, which does make splitting such large logs easier. Again, having the vertical feature on a log splitter is a must if you have large rounds. The auto throttle control makes a big difference when you are splitting softer woods, it switches into a high gear and just go through the logs like a hot knife through butter. This NorthStar machine comes with the smaller Honda GX200 series engine. Just because it’s smaller certainly doesn’t mean it lacks power. It still has an impressive 6.5Hp which is plenty of power for a 30 ton machine. But the most important thing is how reliable it is, there is nothing worse then being in the middle of winter and your engine won’t start. This is something that shouldn’t happen with this engine as long as you have the right oils in the engine and maintain it well. Overall a great engine attached to a great log splitter. Watch this short video from the manufacturers to see exactly what you get when you buy a 30 ton by Northstar.